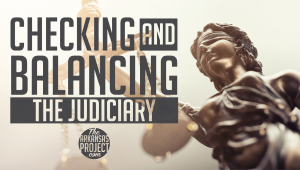 How should checks-and-balances – the heart of our governmental system – be applied to the judiciary? This question is at play in the debate over Issue 1, the tort reform amendment facing Arkansas voters in December. A provision of this ballot question would give the legislature power to amend or annul judicial rules by a three-fifths vote. What Porter fails to understand is that returning power to legislators to amend or annul judicial rules (power that legislators had for most of the state’s history) is intimately related to tort reform. Without that ability, the judiciary will continue to thwart efforts to make reasonable reforms in the tort system. The state Supreme Court, after the passage of Amendment 80 in 2000, has continued to adopt an aggressive interpretation of its own powers. In 2007, the state Supreme Court struck down the legislature’s medical malpractice reforms as unconstitutional, because it found that the procedure that the legislature had enacted was disallowed. In 2009, the state Supreme Court struck down a procedure that the legislature had proposed to determine fault for parties who were not represented in court; in 2012, the Court struck down new rules for the admission of evidence in medical malpractice cases, because – once again – this was a power that the Court said the legislature should not exercise. All of these issues can reasonably be understood as issues of public policy; where we have courts determining issues of public policy, we have a collapse of the separation of powers. Those who feel that there is room for improvement in our justice system should note that the Court’s interpretation of Amendment 80 makes it difficult or impossible for the legislature to pass legal reforms (such as, for instance, loser-pays reforms) that would reduce the costs or increase the efficiencies of the legal process. As these incidents illustrate, if people “favor the first part of the amendment that limits fees to lawyers,” in Porter’s words, then they should also favor the second part. It is this provision that will prevent the judiciary from undoing legislation that puts these limits in place. When the judiciary has a monopoly on rule-making, then the judiciary will use that power to stop the will of the people when it comes to tort reform. It is necessary to introduce some checks-and-balances into the system to ensure that this does not happen. It is not a “power grab” as Porter claims, but merely a proper limit on the power of the judiciary. ← Who Makes the Rules?